A classic, comfortable sun hat that protects in style. Featuring a soft, flexible brim, the hat won’t flop over eyes no matter how many times its slept on or folded up in a bag. Made from a ‘silky-feel’ woven cotton fabric and 8-way stretch fabric technology ensures a great fit every time! 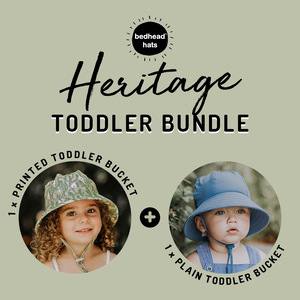 The Heritage Toddler Bucket Hat is light and airy to touch and wear, making it a good choice for kids who might usually fuss over a hat – they’ll barely notice they’re wearing it! Like all Bedhead hats, the Toddler Bucket Hats feature our famous UPF50+ excellent protection – the highest possible!